Streets are being built at Edgewater Village on Tuesday. CARA, Albany’s downtown urban renewal program, this week is beginning to see tangible results from two of the biggest projects it has supported with financial aid. It also faces the tough call of whether to extend and perhaps even forgive a $200,000 loan whose terms call for it to be repaid now. 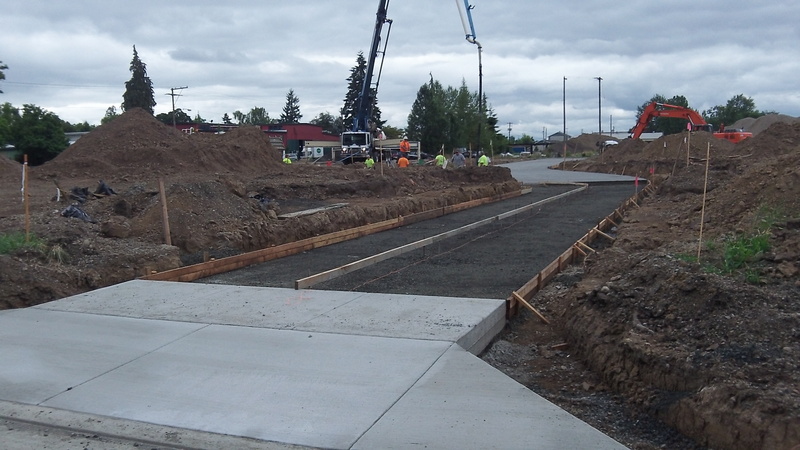 First, the tangible results: Contractors are making swift progress on putting in streets and what appear to be concrete alleys or paths in the first phase of Edgewater Village, the riverside development that plans to build the first five of 60 houses on the Willamette River this fall. CARA has spent $2.4 million on the project. 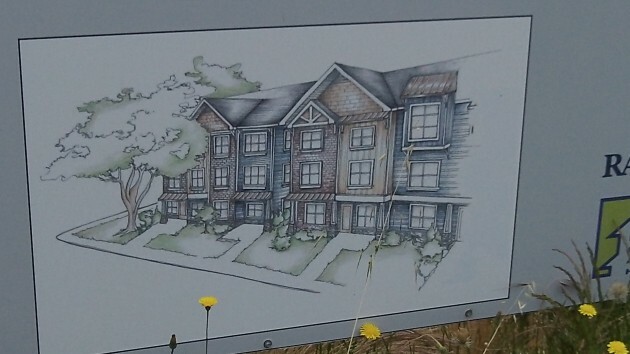 Full development will take several years — the CARA board recently extended all the deadlines by a few months — and once the 60 houses are built and sold for an average $225,000 each, arithmetic says the project will add $13.5 million to the taxable value of downtown. Sign shows off the concept of the new Woodland Square. Also this week, on Monday, Innovative Housing Inc. of Portland and city officials had a little ceremony to start construction of Woodland Square, the 54-unit apartment complex taking the place of the dilapidated trailer park of the same name at Pine Street and Second Avenue. The next day, the sign of progress was that Greenberry Construction’s trailer was parked on Pine. CARA contributed about $850,000 toward what is expected to be a $10 million project. Other financing comes from state tax credits and private sources. One of the side benefits of Woodland Square is that the project will also clean up the jungle-like banks of Periwinkle Creek on the parcel’s eastern edge and build a public path there. 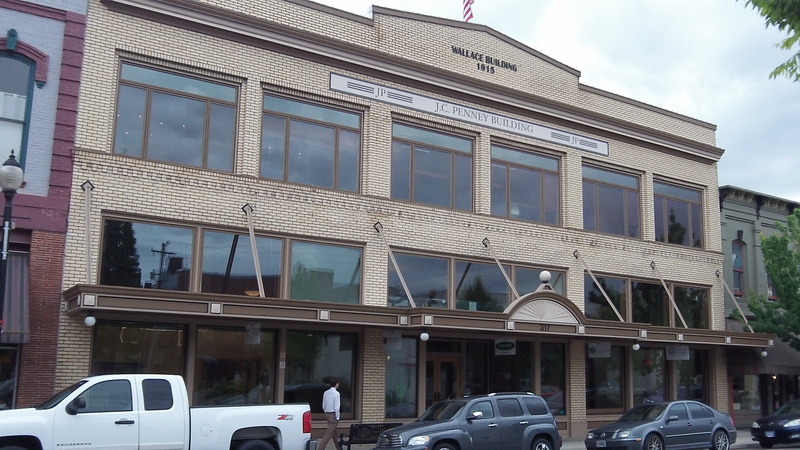 The J.C. Penney Building has not found someone to open a restaurant. As for the tough call, the CARA board has been asked to modify a $200,000 forgivable loan it agreed in 2009 to provide in order to make sure a restaurant opens on the ground floor or the renovated J.C. Penney Building. (CARA also gave the $5.4 million renovation project $542,500.) Owner Rick Mikesell says he spent more than the loan amount to outfit the space for a restaurant but has been unable to find someone who wants to open one there. He’s asking for another two years to land a restaurant. If he can’t find one, he’d like the loan to be forgiven anyway and he’ll find someone to lease the space for some other purpose. On the one hand, there’s the contract and the $200,000 that CARA would like back. On the other, the money has been spent the way CARA wanted, except that the demand for a restaurant (with at least 200 seats and open for lunch and dinner at least five days a week) proved unrealistic. There’s already a surplus of restaurants downtown. The space that used to be Wyatt’s is empty and for lease. A few blocks away, the Wheelhouse too has been unable to fill its ground floor with a restaurant as CARA had hoped. Good gravy, there is so much wrong with this commentary. First, is the current taxable value of the Edgewater property zero? That is the only way your “arithmetic” works. It’s nonsense. And you fail to mention that the IHI (a nonprofit) property is now off the tax roll. The return on taxpayer “investment” is negative on this project. Thanks for not mentioning that fact. Finally, giving $200K of our tax money to a wealthy developer and family should be something more than a “tough call.” It should be criminal. What say you! Can’t find a private company to invest in the JC Penney’s restaurant?? Perhaps it’s because private guys use their own money and expect to make a profit. I wonder what will happen to all our local banks as the government continues to loan money… Will local banks will be seen as the “evil corporation” trying to extort profit…? Will the government be seen as the benevolent overseer that refuses no-one…? The government is slowly squeezing out private enterprise – just like in socialist countries! This will only get bigger and bigger and bigger – have you ever seen a government program that got smaller? Earlier in this century I chaired for a time the Oregon Seed Council’s committee that directed the USDA Market Access Program funds that we had been able to source. The MAP funds are intended to be used to open new export markets in target countries. After assessing the opportunities in several countries we focused on Mexico and China. After ten years or so the committee reported that we had made substantial progress in the countries and that the MAP committee should call it a day and get out of the way. I, as chair, and a few stalwarts traveled to China to tell our partners at Chinese universities and government agencies that we appreciated their cooperation and that the funds for further research and market development would be coming from Oregon seed companies and not the government, thank you and goodbye. We did the obligatory visit to the agriculture attache in Beijing and his response was, to paraphrase, “good on you. We’ve never seen anyone declare a success and quit the program before.” The USDA, on the other hand tried to prevent us from leaving and said if we did we would never be permitted to participate in the program again. We only got 4 to 500 thousand a year to operate on. The big commodities are getting millions annually in the same program and are doing the same things in the same countries to this day. I’m sure the program didn’t shrink but we tried.